You handle some of the rarest coins in existence. Because you are constantly around coins, do actively collect as well? My experience has been that being actively involved in the coin business is like aversion therapy. There is just so much of a good thing that anyone can take. Once I got into the business part of numismatics in 1979, I found that after eight or nine hours of working with coins I really did not want to go home and work on my coin collection for another couple of hours at night. After about two years, the thrill was gone and I sold my coins to Steve in 1981, and have purchased very few since then, probably none in the past 20 years. That is not to say I don’t collect. I’m of the opinion once you are a collector, you can suppress that instinct or defer it, but the instinct is still there and will resurface at another date or in another form. Once I gave up coins as my collecting outlet I rechanneled that impulse into collecting rare and fine wines. I even built an underground wine cellar. I’ve also collected National Geographic magazines. At one time my set was complete from 1907 to date. I presently collect 19th century Texas newspapers and The Numismatist prior to 1909. There is another aspect of collecting that is related to coins without actually owning them, that is the collection of information. Walter Breen told me that is what he collected. After he said it, I realized that is what I started doing in 1982 when I began to take reading notes from auction catalogs and put the information on 3×5 note cards. It seems quaint now to think of taking notes on note cards, but it was effective, and yes I still have all the note cards! You are a very accomplished author; would you say that you were an author first, or a numismatist? That is a trickier question than it seems on the surface. A person has to have numismatic knowledge in order to have something to write about. Conversely, if you can’t write, it doesn’t matter how much product knowledge you have if you don’t have the ability to effectively communicate. This points out the real problem in locating first-class catalogers. There are very few people who have both in-depth numismatic knowledge and also know how to write. For me, the writing part developed in college. I took 56 hours of history in college, so writing papers just seemed like a natural thing to do. Many of the descriptions I have written over the years came from the discipline of writing history papers in college. 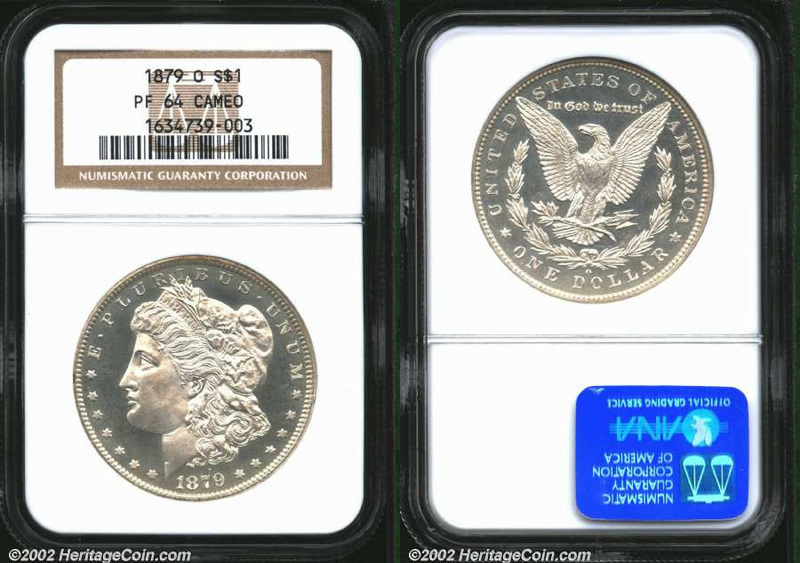 Many extended coin descriptions are a variant on the “compare and contrast” question that is asked on so many history exams. The coin part, I picked up in bits and pieces. I began to collect when I was eight years old (in 1959), but didn’t become really serious about the acquisition and study of coins until after I got out of college. How did you become involved with numismatic writing? I eased into it. In 1980 and 1981 I would occasionally be asked to proofread catalog copy written by Ron Howard, now the finalizer at PCGS. Then once in a while I would be asked to write catalog descriptions for the auction company. A few years later I was asked to write the descriptions for our retail inventory. Next was involvement with Legacy magazine. When the coin market dropped precipitously in 1990 and Legacy was no longer viable, Steve asked me to take over the duties of coin cataloging full time. All the time I was writing catalog descriptions, in-house articles, and articles for Coin World during the 1980s, my main job was selling coins retail. It was a remarkable confluence of events that made it possible for me to step into the job of cataloger just at the time that the retail selling of rare coins essentially disappeared. What was it like being editor of Legacy magazine? Legacy was undoubtedly the biggest learning experience I’ve had in rare coins. The interviews were very time-intensive. There was a good deal of prep time required before each one. Beforehand I would talk to people who knew the subject so I could ask interesting and thought-provoking questions. Usually that worked quite well. But with the first interview there was a problem, one that you wouldn’t know just from reading the text. The first interview I did was with Harry Bass. About halfway through the interview I laid an egg with a question. I asked Harry why the ANS didn’t reach out more to collectors in the U.S. He was visibly angry at the question. He told me to reconsider the question and he would come back into the room in a few minutes. The photographer, Don Netzer, and I just looked at each other wondering what was up. The question, of course, hit a nerve with him because he was responsible for establishing the Coinage of Americas Conference. I knew this, but it didn’t seem like enough to me. When Harry came back into the room, he was patient and explained what all he had done for U.S. collectors. The interview went well afterward, but I really thought for a couple of minutes he was going to pull the plug. Those few sweaty-palm minutes made me realize I had to be even more diligent in my background preparation for future interviews. Legacy was first-class training also for learning the production end of the business. Much of what I learned as editor then applies directly to what I do now when we produce auction catalogs. With Legacy I had to do everything to get each magazine into print. Now we have an entire Marketing Department that does many of the things I had to do then. Undoubtedly the enduring feature of Legacy was the interviews. The interviews placed me with a microphone and recorder in front of some of the greatest names in numismatics. Some of those guys had histories in coins that stretched back to the late 1930s. As such, they were a link to the generation that came before them. For instance, John Ford knew Thomas Elder, Walter Breen was employed by Wayte Raymond, Lester Merkin was a jazz musician before he was a coin dealer and played in jam sessions with Charlie Christian, the first person to use the modern electric guitar as we now know it. Can you describe your duties as Chief Cataloger for Heritage Auction Galleries? The idea is to keep everyone moving along the same path toward completion of the next catalog. But sometimes that means thinking two or three catalogs ahead of time. For example, in order to not be absolutely crushed by the work load for a FUN Sale, one or two catalogers will start cataloging the FUN coins we have as early as August. I also work closely with Marketing and the printer in the production of each catalog. There are considerable behind-the-scenes responsibilities in what I do. If a catalog looks nice, the descriptions read well, and the photography is well done, then I’ve done my job well. You have been a part of Heritage from the very beginning and have seen the company grow and prosper. What has that been like? It’s bewildering. As a manager I try to know as many of the employees as possible, but with more than 300 people working here now in 30 venues of collectibles it just isn’t realistic to know everyone like I did in 1979. When I was hired 32 years ago I was the 24th employee, and we thought then we were a huge company! You’ve cataloged some of the rarest collections in existence, out of all of them, which was your favorite to work with? There have been so many … Trompeter, Chestatee, Duke’s Creek, North Georgia, the list just goes on and on. But the one that sticks in my mind as my favorite is one few people probably remember: The Anita Maxwell Collection of Branch Mint Proof Morgan Dollars. That was a part of the 1995 ANA Sale. It was only eight coins, but those eight coins provided me with such a terrific learning opportunity. It was a chance to see what makes a Branch Mint Proof. I studied those eight coins with a microscope, took die notes, and published the results in an article in Coin World. It was a revelation to me. The Branch Mints didn’t really know how to produce proofs like Philadelphia did. They knew what a proof looked like and tried to imitate what the Philadelphia Mint did with the equipment and personnel they had. But there are flaws, like incomplete die polishing and die striae that you just wouldn’t see on a P-mint proof. That collection stands out because it provided me with the greatest opportunity to learn. Can you tell us what you consider to be the greatest aspect of your job? In a company as large as Heritage, it is the satisfaction of knowing I have been a part of something that is bigger than my individual effort. So many people enter into the production of each catalog—the writing, photography, proofreading, press checks, and printing. And the coin catalogs are just one cog in the wheel of the company that generates enough revenue to support 300+ employees. There are so many other venues that handle really interesting items, venues like Illustration Art, Entertainment Memorabilia, Fine Art, Sports, Comics, Rare Books, and so on. Being in this environment has given me the opportunity to see collectibles that would otherwise be unavailable. A couple of years ago I held the wrist watch that Buddy Holly was wearing when the plane crashed in 1959. Last week I examined four leaves from Illuminated Manuscripts that were hand-painted and hand-printed in the early 1400s. Can you tell us about what you consider to be your momentous moment of your career? Probably interviewing John Ford for Legacy magazine. We did the interviews in his house over two days. As you know, even after his death John continues to be a lightning rod of opinion, both positive and negative. As an interviewee, he was especially challenging. He was always testing me to see what level of knowledge I had about a particular subject, which was disconcerting having the tables turned on me! I must say, though, the results were worth the effort. The interviews with John still stand up today. If you haven’t read them, I highly recommend going into the Heritage Archives and looking them up. There are some great stories in those two interviews. Do you have any advice for young numismatists who aspire to be authors? Just three words: Read good writers. Images for this article courtesy of Heritage Auction Galleries.